Hey guys! Jacqueline here. It’s no secret I love a good DIY project, and what better time to do one than in the middle of winter when you’re stuck in the house dreaming of warmer weather! I am nearing the end of my maternity leave and I swear- since I have been home, all I have wanted to do is style the house (just ask my husband). We’ve completed a few projects, that in my opinion, have been on our to-do list for far too long. One of those projects was finishing our ‘formal’ living room. I have always hated this space because you have to walk through it to get the family room and I would always pretend that the sad, bare room was nonexistent. 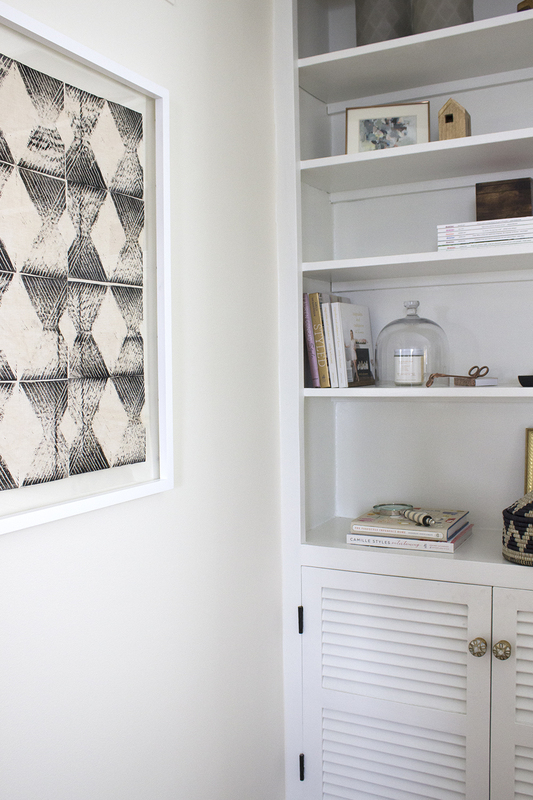 We have finally been fixing it up and this DIY project will be one of the room’s finishing touches. Inspired by this block print chair and framed graphic fabric, I decided to make and frame something new / unexpected for the space. Read more about the process below! To start, I found this block printing kit on Amazon that included most of the items I would need for the project. I also picked up some fabric block printing ink since I would be printing on fabric (I used a piece of white linen from my local fabric store). I liked the idea of dying the fabric to give it a cool vintage look, so I dyed it with super concentrated coffee overnight. First, I soaked the linen with water and rung it out. Then I placed the fabric in a large pot of hot coffee and made sure all of the fabric was fully saturated and submerged under the liquid. I used the lid from a smaller pot to keep the fabric weighted down- or you can use okitchen utensils such as spoons and/or tongs to agitate the fabric periodically. 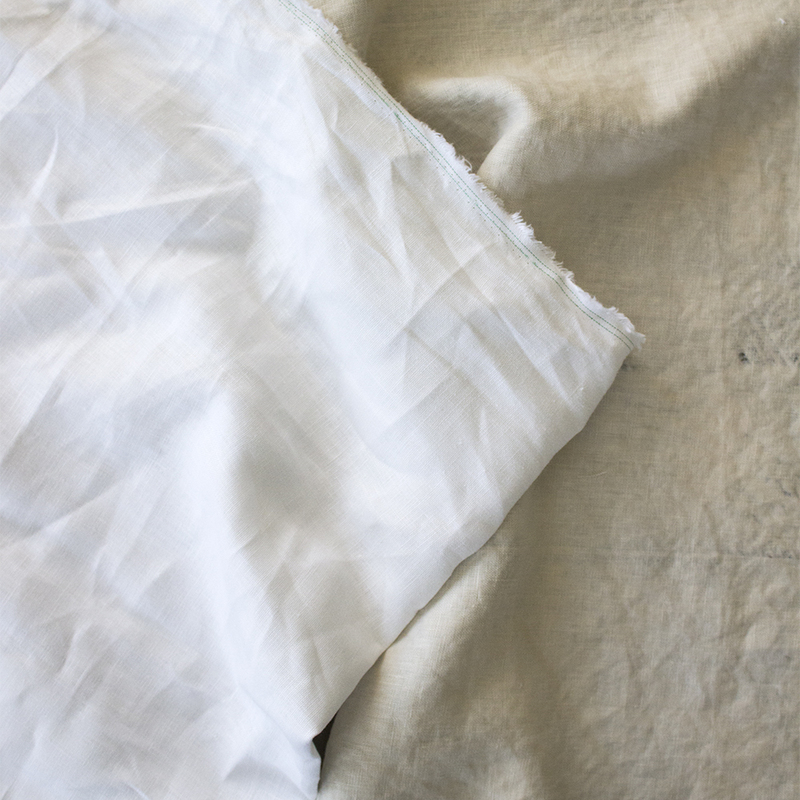 For more on staining fabrics with natural ingredients, see this tutorial. Next, it was time to carve the stamp. If you have never carved before, it can take a long time depending on how detailed your print is. I decided to do something simple and minimal. I liked the shape of the stamp from the chair inspiration DIY because it complemented similar shapes found in our vintage rug (which I scored from this roundup : #9), so I decided to mimic that on the stamp. First I drew the design directly onto the stamp using a ruler and a pencil, then I carved the block. All-in-all it took me about 45 minutes to carve. Also remember, anything you carve will be negative space – I had to carve down the sides so they wouldn’t show up on my print. 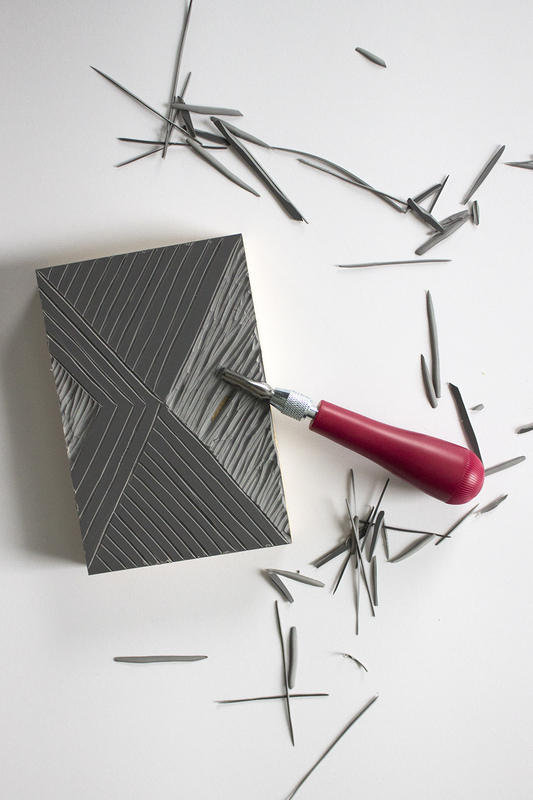 After you decide what you want your print to look like, it’s time to stamp away! 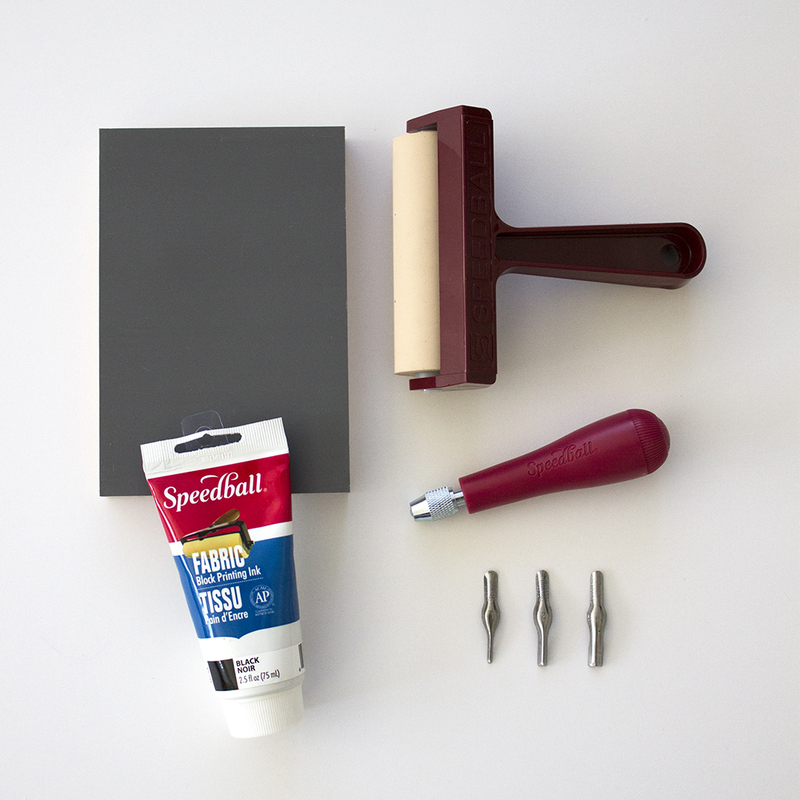 Squeeze a little bit of ink out onto a piece of old glass or foam poster board and roll it out so it’s even on the rubber brayer before rolling onto the stamp. I had to re-roll my stamp each time I printed. My stamp turned out a little uneven on the fabric (which I didn’t like at first), but when it was finished it had a more worn, vintage look that I actually prefer! My sister even said, “It looks like it’s supposed to be that way”. Ha! If you want a more even, consistent look- apply a thicker coat of ink, and more pressure. Sooo, something I didn’t know about block printing…it takes awhile to dry- especially on fabric! Mine took about 5-6 days(!) to dry before I was able to frame it. You can wash the fabric once it’s dry, but I decide not to since I planned to frame it (plus, I didn’t want the dye to bleed/fade). Even with the uneven printing, I am really excited with how this project turned out! 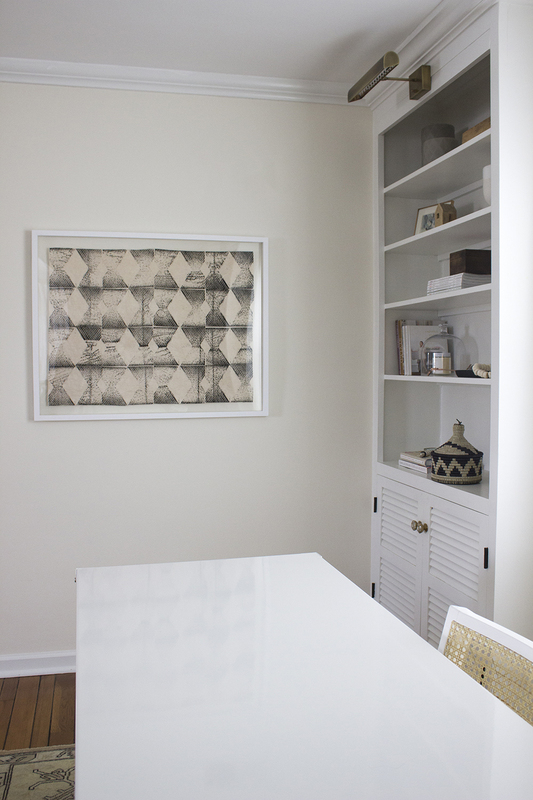 I love having something other than photographs and art prints framed in our home…it’s unique and fits the space perfectly. 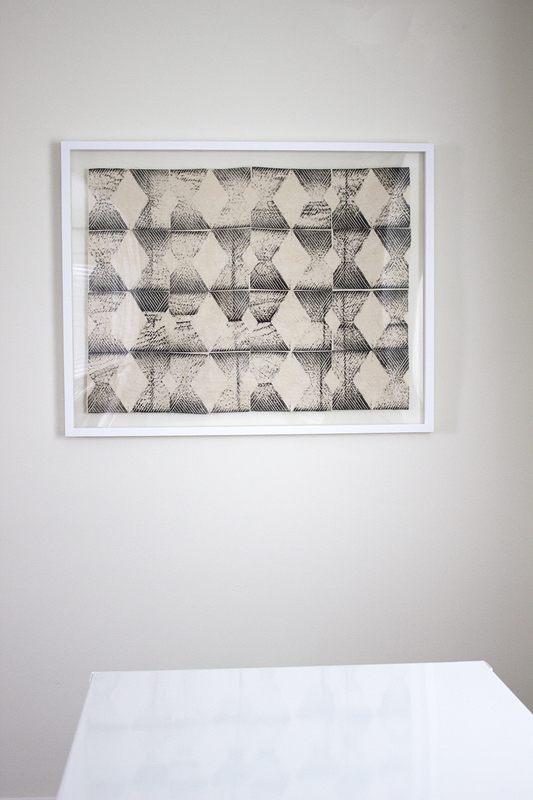 It adds depth, texture, and an interesting material to the otherwise boring wall. You could get creative with scale (a giant framed textile would be so fun! ), color, and pattern. The possibilities are endless. How many of you have block printed before? 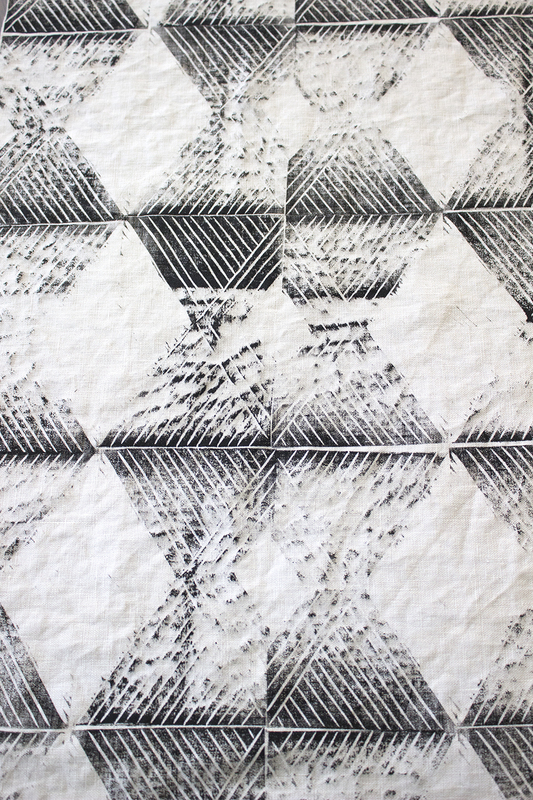 I’d love to hear about other block printing projects you’ve attempted. Share in the comments below!